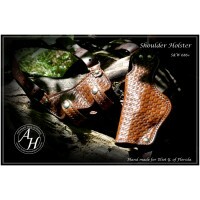 Our primary focus is producing a comfortable and concealable holster. 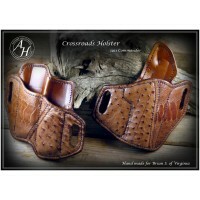 We make every holster , one at a time by hand. 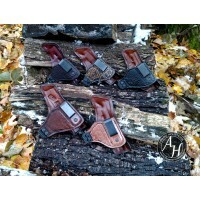 We hand cut and make every single one of these holsters. 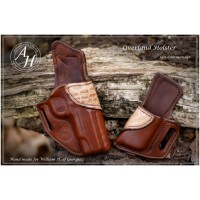 We use premium US tanned leather which makes a beautiful, durable holster that just works. We currently offer holsters for many common handguns(over 120 currently) from the venerable 1911 to nearly all common carry guns including GLOCK's, and S&W M&P's. For more models please look under the holster your looking to purchase for a list of guns that are available for that model. Also if you don't see it listed feel free to shoot me an email to see if I can get it or recommend someone else who might be able to find you a rig. 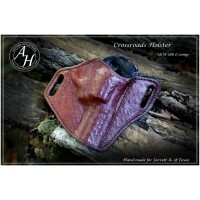 My outside the waistband pancake holster that creates an nice tight conceal.. 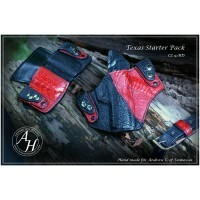 This is a starter pack including a Texas holster, Texas mag carrier and a h..
Introduction to the designMy appendix holster draws inspiration from many other designs currently on..
My new horizontal shoulder holster. 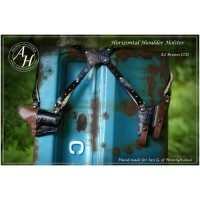 Designed to carry a full sized handgun comfortably for al..
My new vertical shoulder holster. Designed to carry a full sized handgun comfortably for all ..
One of my first designs but still great and very comfortable. 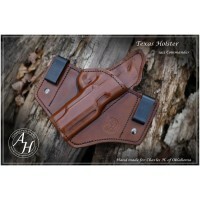 The Texas holster de..
My outside the waistband pancake holster that creates an nice tight concealable pl.. This is my take on the Avenger or Professional holster. It has a much milder forward cant than sa..